Diabetes mellitus occurs either when the pancreas cannot secrete sufficient insulin; or when the body does not respond to the released insulin that is released by the pancreas. This means that the sugars and nutrients consumed are not taken up by the body efficiently. They remain in the blood for a longer period of time than is normal (hyperglycaemia) and are excreted in the urine (glucosuria). Diabetes mellitus is a disorder which is seen at a rate of roughly one in every two hundred and fifty dogs or cats. There are large differences in the way that the disease is presented between these species. Virtually all dogs suffer from the insulin-dependent form; whereby insulin is not produced and must be administered. In contrast, about fifty percent of diabetic cats have the non-insulin dependent form, whereby the body is resistant to the insulin produced, so it does not produce the physiological effects that it should. The cause of diabetes is multifactorial. It is more common in older animals and often occurs in association with another disease or condition such as bacterial infections, pregnancy, Cushings syndrome, kidney or liver failure. In dogs diabetes appears to have a genetic component, with some breeds being more predisposed than others. These include Miniature Poodles, Dachshunds, Schnauzers and Beagles. It can be immune-mediated in some cases, where the body attacks its own cells that are necessary for insulin production. Pancreatitis (inflammation of the pancreas) is also commonly involved in the induction of the disease in both cats and dogs. Feline diabetes is very often associated with obesity. The risk of diabetes is one of the main reasons that obesity in pets must be avoided. Frequently, in cats, and more rarely in dogs, the diabetes that is diagnosed and treated is only a temporary condition. A stressor can create a state of high blood glucose which then suppresses insulin release. This can become a vicious cycle. However, when insulin is administered and blood sugar levels return to normal, then further treatment is unnecessary. This can only be determined retrospectively after treatment has been initiated. Treatment for diabetes is the administration of insulin. Dogs generally respond better to insulin derived from pigs, and cats to insulin from cows. An overdose of insulin leads to low blood sugar or hypoglycaemia, which causes weakness and shivering, and in extreme cases, seizures. The dose of insulin required varies from animal to animal and the best way to ascertain the ideal dose is by performing a glucose curve. This involves checking the blood glucose every two hours over the course of one day and putting the values into a graph format to assess the fluctuations. The aim is to adjust the amount and frequency of feeds with insulin administration to avoid dips and crests in the curve as much as possible. Initially, glucose curves should be made every two weeks until the glucose levels are effectively controlled by the dose of insulin given. It can take up to six months to find the correct dose and timing of insulin administration. Insulin can be given by the owner in a special insulin syringe. Insulin must be kept in the fridge and must be given at the same time every day. Routine is very important in the management of diabetes, with feeding times (the intake of calories) and the timing of treatment being kept constant as much as possible. There is another drug available which helps to control diabetes and can be given orally to some cats, providing that they are otherwise healthy. It is not given to dogs. 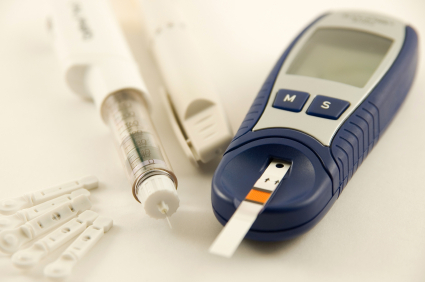 The management of diabetes involves other factors besides medical treatment. Keeping the diabetic animal lean is a priority as obesity can lead to worsening of the condition. A diet that is low in calories and high in fibre is ideal. Complex carbohydrates slow down absorption of sugar, and minimize blood sugar fluctuations. Veterinary prescription diets are readily available from the vet and assists greatly in the treatment and management of diabetes. Routine exercise is also helpful in controlling blood sugar and keeping the diabetic animal healthy. Exercise of the same duration and at the same time every day helps to maintain weight and to increase insulin sensitivity. Taking the diabetic dog for a short walk every day is far preferable to a long walk once a week. Strenuous exercise can lead to hypoglycaemia. Unfortunately diet and exercise cannot be used alone to manage the diabetic patient. Insulin administration is necessary and this treatment requires dedication and commitment on part of an owner of a diabetic animal, to be successful. Prognosis depends on the presence of concurrent disease, response to treatment and the owner’s commitment. Long term prognosis in cats is generally guarded, with the average survival time being two years. Dogs can survive for a number of years after diagnosis, and similar to the treatment of diabetes in human beings, can live a relatively normal and happy life as long as the consistent treatment and management of the disease is maintained. Once the disease has been properly diagnosed and a formal treatment and management routine has been implemented, the prognosis is quite good. The most dangerous period is before the most efficient dosage of insulin has been found, when blood sugar is fluctuating. Many diabetic pets respond well to therapy and with consistent and correct treatment, their quality of life is excellent. The key to success generally lies in the hands of the owner, and how willing and able they are to give the time, effort, money and commitment needed to treat a diabetic pet.